Sugar figs have brown or amber pulp. Plain sweet or various sugar flavor. Dark skin, often dark purple, ranging through any of many shades of brown, red, blue, or black. Honey figs have golden pulp, ranging to caramel. Honey-like or agave nectar flavor. Yellow skin. Berry figs have purple or red pulp. Various strawberry jam based flavors. Green skin or any of many shades of dark skin. Resin Berry. Punch Berry. Citric Berry. Tannin Berry. Resin berry figs have red pulp. Strawberry jam and tannic flavor. Dark maroon, purple, or black skin. Punch Berry figs have purple or red pulp. Mixed berry, strawberry jam and grape based flavor. Dark skin, often dark purple or black, unless mottled with light colors. Citric berry figs have red pulp. Strawberry jam and acidic flavor. Green skin. Tannin berry figs may have more brown or translucence in the red pulp and may have a bitter (tannic) edge to the berry flavor. Thin light green skin may tend toward yellowish tints. Sugar-berry figs have light maroon pulp. Sweet fruity flavor. Dark skin. Honey-berry figs have blush or red pulp. Fruit juice with honey flavor. Yellowish or greenish skin. Caramel figs have beige to tan to tawny pulp. Various sugar or mild honey flavors. Dark skin. Agave figs have light yellow or gold pulp. Agave nectar flavors or neutral honey. Bright yellow skin. Sugar figs have a plain sweet taste, often very sweet, sometimes with a maple flavor or various off-sugar flavors. Honey figs have the flavor of honey, sometimes tending to caramel, or to agave nectar flavor. 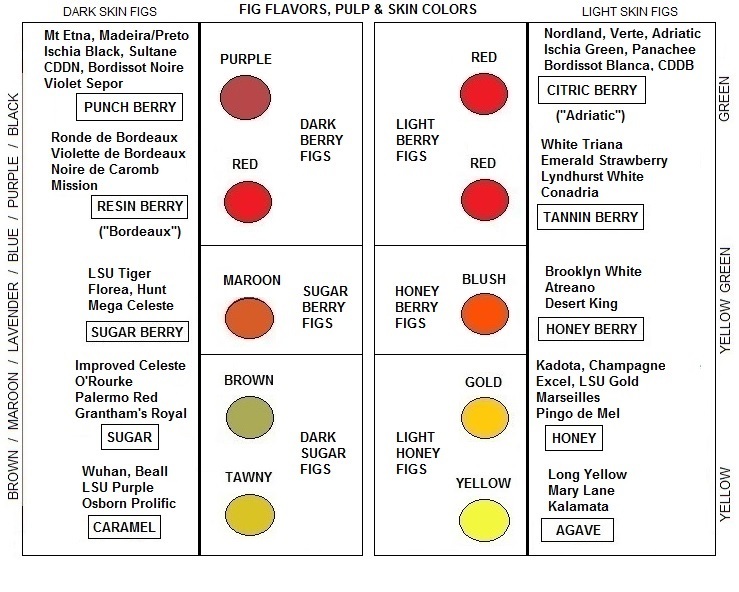 The off-berry flavors of resin berry and tannin berry may have a bitter (resinous or tannic) taste that seems to come from the skin, or just underneath it. The in-between berry flavors of sugar-berry and honey-berry have more of a general berry or fruity flavor and less of the strawberry jam flavor of the resin, citric, tannin, and punch berry figs. While flavor is found to a significant extent in the skin and in the flesh between the skin and pulp, most fig flavor concentrates in the gel pulp of figs, per the photos above, and below.